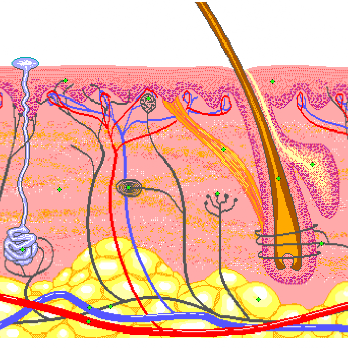 Skin, together with your hair, nails, sweat and oil glands, all make up your integumentary system. (You pronounce it just like it’s spelled- in teg’ yoo men’ tuh ree). Our focus today will be the skin. Your skin is your largest organ. That being said, you need to take good care of this organ! Now, perhaps you’re wondering what makes it an organ, as it’s nothing like a liver or your heart. Well, the simple scientific definition of an organ is simply a group of tissues working together together to carry out specific functions or jobs. You likely heard early in life that if your skin is intact, it’ll keep the bad stuff out & the good stuff in 😉 . If you were listening, you’ll remember that the top layer is the epidermis, & the next layer is the dermis. Taking care of this organ is not luxury, it’s good stewardship! (Stewardship will be the subject of a future blog, but for now suffice it to say, stewardship is caring for those things, people, etc. that we have responsibility for). There are 2 layers to your skin, the epidermis and the dermis. >The epidermis is responsible for protecting your bloodstream from pathogens. >The dermis contains connective tissue & nerves, as well as blood vessels, hair follicles, oil & sweat glands. The average adult sheds about 2 lbs of skin cells a year! Yuck! The thickness of your skin ranges from <.5mm on your eyelids to >1.5mm on the soles of your feet. Once for ounce, your skin is stronger than steel! Your skin makes up approximately 15% of your total body weight. This means if you weigh what the average American weighs, which is about 178 lbs, your skin weighs approximately 27 pounds. An average square inch of skin holds approx. 600 sweat glands, 20 feet of blood vessels, 60,000 melanocytes*, & often more than 1,000 nerve endings. No we’re not saying that if you don’t use our products that you’ll come unglued & spill everywhere, lol. But please take good care of this organ, partly by putting as few synthetic chemicals on your skin as possible! *Melanocytes are the biological reason behind different skin color. No, it’s NOT evolution, but God’s creativity! Look around you: flowers, trees, grasses and people all display His creativity in different shapes, sizes, and colors! Imagine with me for a moment that all flowers were white with 6, daisy-like petals… ugh, booorring! But, quite simply, The God of creation, Jesus Christ, gave us wonderful variety to enjoy! People, also, are different shapes, sizes, and colors, and melanocytes are the thing behind the color variety in people, while Porphyrin, Carotenoids, and Flavonoids are responsible for the color variety in plants!